Though you spend the vast majority of your time at home being inside of it, that doesn’t mean that you shouldn’t care about how your home looks from the outside. Your home is a reflection of who you are. If you run a business from your house or you own a small business and rent out a unit of space, keeping things looking nice and tidy from the outside matters even more. All things considered, it’s important to take pride in the areas that you live your life. So, while what goes on inside of your home is completely your own business, how your front yard looks isn’t entirely your own business. From the watchful eye of the ever-nagging HOA to your nosy neighbor with nothing better to do than watch your grass grow (get a job, Jerry! ), you’ll want a reliable landscaper in Gainesville that can help make your yard the envy of the block. Thinking about selling your home? There’s no better time to focus and invest in a residential landscaper like us here at Gainesville Lawnscaping. From full service lawn care to sod installation, mulch installation, irrigation repair and even full-blown landscaping design should you want to completely overhaul your yard, our team has you covered! Get in touch with us here. 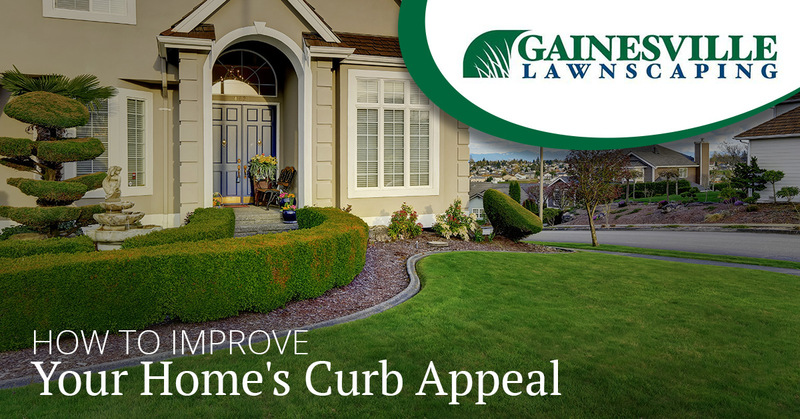 Below, you’ll find some practical ways to improve your home’s curb appeal. If you have a front porch, get a fairly inexpensive set of outdoor chairs and a small table. For those without a front porch or covered area near your front door, make use of other grassy space or open areas in your yard. A brand new welcome mat doesn’t hurt, either. Why not? If your home is a little aged and in need of a refreshing coat of paint, this simple and fairly inexpensive upgrade can go a long way in making your home “pop.” Bold colors are a fun way to go, but make sure that the color also matches the other colors on your house. Not only does this make the pizza delivery drivers’ job easier, but this is a great way to help spruce up the exterior of your home in general. Going with a modern font for your house number is sure to help a 20th century home rocket into the 21st century. While you can leave the bulk of your residential landscaping up to us, adding a colorful touch to your front walkway or porch area with a series of flower boxes or well-placed trees is sure to breathe life into the outside of your home. Bonus points if you plant two trees to “frame” your entryway! From your home to your business, it’s our job to make the area aesthetically pleasing and a place where friends, family, and customers actually want to spend time. Contact Gainesville Lawnscaping today to improve your home with our residential lawn care services and more! Check Out Our Landscaping Gallery Here! ©2019 Gainesville Lawnscaping | All rights reserved.